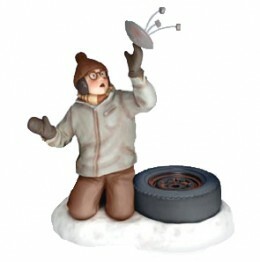 Home » Entertainment » A Christmas Story Collectibles – We Triple-Dog Dare You to Look! A Christmas Story Collectibles – We Triple-Dog Dare You to Look! The movie landscape is filled with memorable Christmas movies. Few are more beloved today than A Christmas Story. The nostalgia-fueled film captures the "good old days" to perfection, incorporating both the magic and the horror of the holiday season. Today, fans and collectors have a ton of A Christmas Story collectibles to chase. When it was released in 1983, A Christmas Story was only a moderate success. But thanks to the magic of home video and annual 24-hour marathons on TBS, the movie has gone on to achieve a massive following with very few holiday rivals. Filled with colorful characters and plenty of memorable quotes, it's the perfect film for a broad range of collectibles. And that's just what's happened in recent years. Here's a list of some of the best A Christmas Story collectibles and memorabilia available. Outside of costumes and props used to make the movie, original theatrical posters are one of the most collectible items from A Christmas Story. Thanks to numerous VHS, DVD and Blu-ray releases, the artwork has become an iconic piece of modern movie history. A second poster features Ralphie getting hit in the face with a snowball with the tagline, "It's better to give than receive." This one isn't nearly as recognizable but is still very popular with movie poster collectors. While most movie posters today can be found with double-sided printing and are often rolled up, this wasn't the case back in 1983. Chances are, the original movie posters you find will have evidence of folding and the creases that go along with it. Depending on the condition, original posters can run several hundreds of dollars. If you're simply looking for a display piece, reprints are widely available for less than $20. 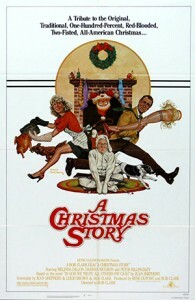 Shop for A Christmas Story posters on eBay. 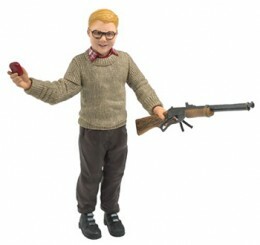 NECA produced a line of detailed action figures that cover the key characters of A Christmas Story. Standing approximately seven inches tall, they include Ralphie (with bar of soap and Red Ryder BB Gun), the Old Man (with Leg Lamp), Mom and Randy, and Flick. 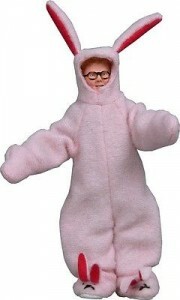 A second Ralphie figure has him in the pink bunny suit. A box set comes with Ralphie, Randy, Flick and Scut Farkus, the bully that torments the neighborhood. Ralphie and the Old Man have been remade as larger figures that come with sound chips. The bigger Ralphie stands ten inches. His dad is about a foot tall. Shop for NECA A Christmas story figures on eBay. A Christmas Story fans have three Funko Pop vinyl figures to look for. There's Cowboy Ralphie, Bunny Suit Ralphie and The Old Man. 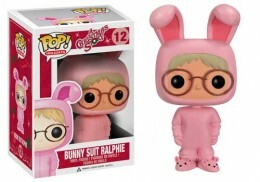 Bunny Suit Ralphie has a "flocked" variant that is exclusive to Gemini Collectors and is limited to 480 copies. These stylized vinyl figures are 3.75 inches tall. Like all figures in the Pop line, they are designed to be fairly simple, almost like a cartoon. Shop for Funko Pop A Christmas Story figures on eBay. 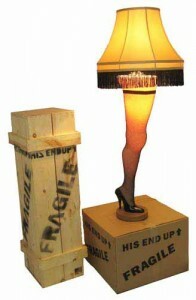 Is there any item more iconic to A Christmas Story than the infamous leg lamp? BB guns and bunny suits are great, but they're bigger parts of the broader childhood experience. But a leg lamp? They're the "major prize" among A Christmas Story collectibles. Leg lamps come in all shapes and size. They range from night lights to replicas measuring almost four feet tall. Just be careful that if you put out a leg lamp for the holiday season that it doesn't become the source of a major family controversy. Shop for Leg Lamps on eBay. 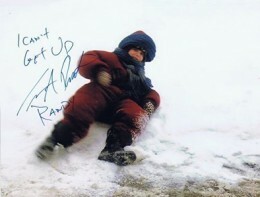 Autographs from the stars of A Christmas Story are, for the most part, very affordable today. Although many of the kids continued to work in film, none reached A-list superstardom. The most common are Peter Billingsley (Ralphie) and Scott Schwartz (Flick). Ian Petrella (Randy) and Zack Ward (Scut) appear to be the most common. Signed photos are the most popular option. However, collectors can find autographs on just about anything related to the film including action figures, scripts and even board games. To ensure items are authentic, look for items that are certified by reputable third-party companies like PSA/DNA. 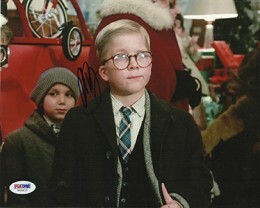 Shop for Autographs from A Christmas Story on eBay. The Department 56 A Christmas Story Village is one of the most comprehensive collectible lines connected to the classic film. 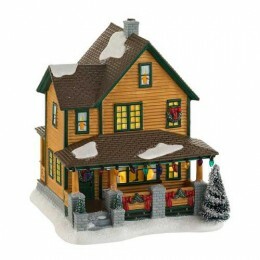 Giving a pop culture spin on the traditional Christmas village, the series includes lighted buildings, accessories and characters. From homes to shops, collectors can build and expand the fictional Indiana town. An evolving line, several pieces have been retired while new ones are being introduced. A more high-end item, these are pricier than most other A Christmas Story collectibles. Shop for Department 56 A Christmas Story Village pieces on eBay. 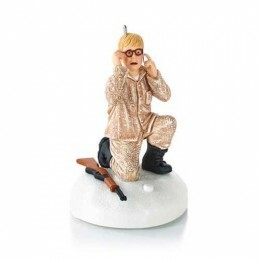 Hallmark has made enough A Christmas Story ornaments that you can probably dedicate an entire tree to the film. Every year they come out with new pieces that showcase the movie's most memorable moments. Mass produced, they may not gain much value, but they are one of the easiest pieces to display. They're generally nicely detailed. Several of them come with audio clips as well. Shop for Hallmark Christmas ornaments on eBay. Bobbleheads aren't just for stadium giveaways. NECA has produced a handful of different Headknockers for A Christmas Story. 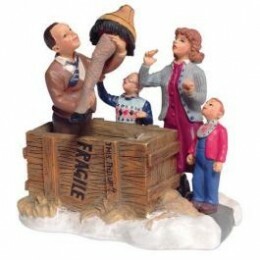 The big-head pieces feature Ralphie (with or without his pink bunny suit), the Leg Lamp and the Old Man. These are among the most affordable display-worthy collectibles for the movie. Shop for A Christmas Story bobblehead dolls on eBay. Up for a little A Christmas Story cosplay? Perhaps you want to be a rebel at the office's ugly sweater party. Channel your inner Ralphie and go pink. Available in kids and adult sizes, A Christmas Story-inspired pink bunny suits also make for memorable photos with Santa. 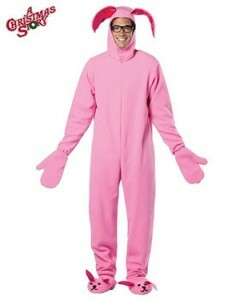 Shop for pink bunny suits on eBay. 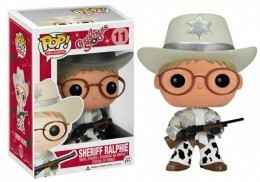 A Christmas Story Movie Watch Ralphie BB Gun and LEG LAMP WATCHES!